Hornady's 6.8 SPC SST features a choice designer bullet for hunters the world over. Its specially designed polymer tip and boat-tail shape allow for maximum accuracy while providing favorable terminal behavior on impact. The higher pressure load of Hornady's Custom ammo also allows them to travel faster than their standard rounds, giving them more punch than their competitors. This 6.8 SPC Super Shock Tip ammunition won't leave you guessing as to whether or not you brought enough bullet for your game. 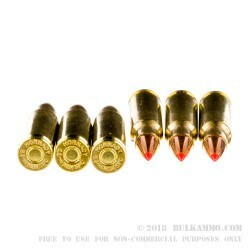 These rounds are ideal for hunting medium to large game. 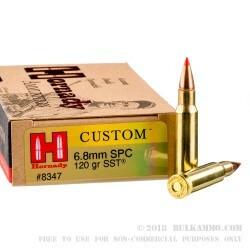 These Hornady SST 6.8 SPC 120 grain rounds produce 1,612 foot pounds of muzzle energy, and travel at 2,460 feet per second out of the barrel. Their boxer-primed brass is safe for reuse. 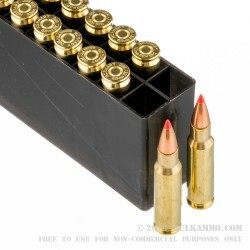 The cartridges come packaged in a 20-round tray boxed in the well-known Hornady cardstock boxes..